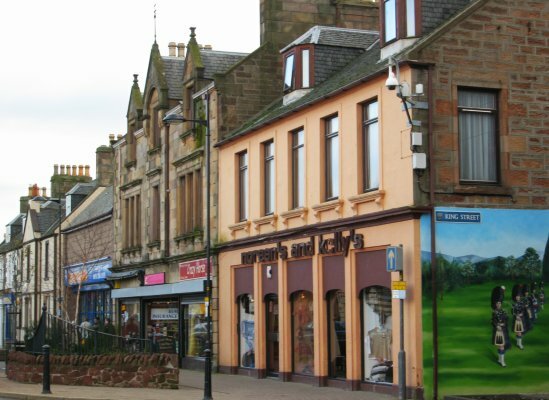 Invergordon High Street @ High.St - High Street shops and High St businesses. Large Google map of Invergordon High St. The deep inland waterways around Invergordon have been a natural asset for over 300 years. During the First World War the Royal Navy had a repair facility here and boats regularly stopped to pick up supplies. In 1907 it would not be unusual to see nearly 50 vessels from the Home Fleet visiting the area. Now you are more likely to see huge oil rigs being refurbished or to catch site of one of the many cruise liners that stop here. To accommodate these modern visitors, the High Street is partially pedestrianised, which, with the wide street, provides a safe shopping area. This is made even more attractive with a number of murals painted on the walls of local buildings by 'Invergordon Off the Wall'. To find out more things to do and see, visit the Invergordon Tourism Alliance website or the Invergordon Community website. For information about nearby towns on this site, visit: Alness, Tain and Cromarty. Hopefully, you will not have missed Inverness on your way through, possibly up to Thurso or Wick in the far North. Detailed maps are available from RPA Smith Street Maps web site.